There is perhaps no travel situation more feared than being stuck on a plane with a screaming, energetic child. Whether it's a quick domestic flight or a 12-hour trek from LA to Australia, misbehaving children can become a burden for yourself and everyone around you. Here are some travel tips to make flying with your kids a far more pleasant experience. Kids get bored easily, especially in situations like boarding a plane or going through airport security. It's because of all this constant waiting around that they can become prone to bursts of uncontrollable energy or mid-air fits. To keep their bodies and minds busy, give your little ones their own responsibilities like holding the tickets or keeping track of a carry-on bag filled with games or activities to stay occupied on the flight. While some children may have no problem with flying, others find it to be a frightening experience. Before you even get to the airport, prepare them for everything they'll experience on the plane – putting on their seat belt, takeoff, turbulence, storms and landing. 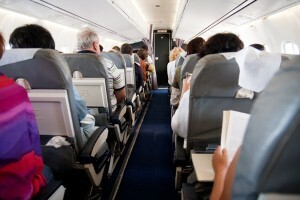 You may also want to clue them in to the fact that flying is statistically much safer than driving. Flying can be an uncomfortable situation even for adults, so don't be surprised if your preparations don't keep your kids from bucking a little. To give them that extra encouragement to behave, offer incentives or rewards for staying calm and collected. A new toy, being able to choose a restaurant for dinner or dessert could be just the thing your little ones need to stay quiet.